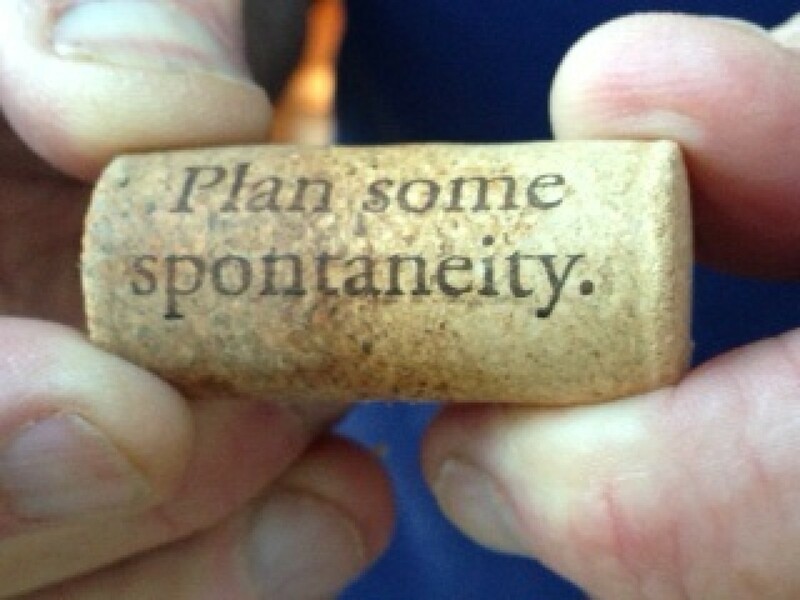 Anyone who's known me for longer than five minutes knows that I am NOT spontaneous. 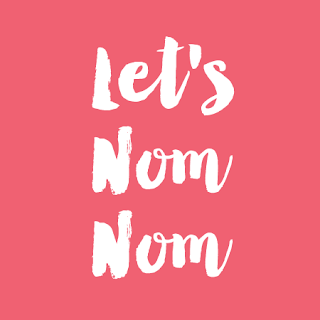 I am ridiculously organized when it comes to events (holiday meals, trips, etc). I'm the binder-Queen. I have binders for everything. My binders have binders. While my organizational skills are often mocked, no one can deny that they are impressive. Lol. 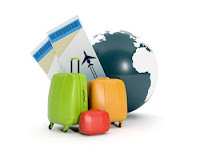 You see, we have these travel points stocked up that we haven't spent yet - and need to before a specific cut off date. We've talked about traveling to see friends, maybe a cruise, perhaps a visit down to our favorite Rocky Point location... nothing really sounded great. So I had a chat with Kayla (my amazing Coach Kayla), If you had a free vacation, and could go anywhere... where would you travel? Her answer sparked a memory from long ago. "So Bill... I have this kind of... wild idea... to use those points." "Well, remember our honeymoon? The one we didn't take but always planned to?" "What if we... modify it? Say... book our flight to London, our flight back home, and the first two nights hotel. Then... wing it the rest of the time?" "And what if we only took carry-on. No checked bags." While my husband now thinks I'm a pod-person, we are both crazily excited!! We now have those flights booked, and the hotel booked... and on our 10th anniversary, we will be arriving in London and checking into the Stafford Hotel - just like we'd planned to do all those years ago. Insane, right?? I'm as giddy as a kid on Christmas morning!! We both are thrilled with our decision, and can't wait to pack up and go. I've ordered special travel backpacks from here, along with packing pods; picked up a power converter, earbuds and a splitter so we can watch whatever on our ipads together during the looooong flights; have begun putting together my "capsule wardrobe"for the 10 days.... I've even registered our trip with STEP (US State Dept of Travel). I'm having a blast planning while not planning. Lol. I've got great travel guides that we may or may not take with us. I've downloaded apps like a currency converter, a french translator (that works even without internet), the UK rail guide, even a track-my-trip app that will let folks follow along with us as we roam. I'M SO EXCITED!!!!! We have no idea if we'll make it to Scotland, or Ireland. We hope to make at least a day trip to Paris, but we may never leave merry 'ol England. For 10 amazing days, we get to do whatever we want, whenever we want (within reason, lol). And we can't wait!!! By the end of this we may need either strait-jackets or bail money... or both! Hahaha!! Woooohooo!!!! Countdown is set... currently it is 1 month, 5 days, 22 hours and 41 minutes until we check in at the airport!!! Ah, the life and death of a vegetable garden at the paws of a puppy. Yep. Hunter struck again. Thankfully, Loki isn't big enough to climb up into the garden beds, but Hunter... oh, Hunter. In the last few days, I've lost my entire crops of brussel sprouts, eggplant, lemongrass, spaghetti squash, half of my corn, two asparagus ferns, one Armenian cucumber, half my iceburg, two of my romaine, three-quarters of my carrots, 3 onions, my broccoli... and my lucky shamrocks. I spent some quality time with the kleenex box. At first, I only lost a quarter of my carrots, but Hunter managed to get in there again before I got the barriers up. Look at Hunter's eyes - see the crazy??? Look at that hole!!! Argggghhhhhh!!! I'm innocent, Mom. It was all Hunter. Barriers. The things that keep curious (and destructive) puppies out my garden. In theory. In reality, Hunter can apparently JUMP the barrier, and when he gets caught (the neighbors down the block heard my scream) he crawls (tears) through the barrier. Joy. While all this is happening, Loki is peeking innocently over the beds to see what big bro is doing. They've learned to fear MY growl. So... since the kids were in town for the weekend, Shi went with me to the nursery to buy replacements. Though evidently brussel sprouts are no longer available. Mine were from seed, so I've sown some more, hoping I haven't missed the window. Sigh. All that aside, my apple tree is budding beautifully, the asian-pears are doing fantastic, my citrus are all great, and my tomatoes are going crazy! Kiwi fruit is in!! Going to train them across the fencing. Aside from the garden antics, we had a great weekend... It's always wonderful to have Shi & Jared in town (with Bear! ), and a full house to enjoy BBQ. At one point we had six dogs running around :-) Mom, Dad, the kids, their friends, the pups... it was awesome! Sunday night we took Loki for his first dinner out :-) There's a restaurant nearby that allows you to dine with your dog (on the patio). It's Uncle Bear's, and the food is amazing. Clearly he was impressed by the experience, lol. Snoozed away under the table. So, that was our weekend. How was yours? Revelations, Updates, Puppies, and A New Recipe!!! Lol. Lots of fun stuff going on. My daughter's (Bethany) puppy is growing like a freaking weed (and I might add that my raised garden beds are weed free - yay!). He's so entertaining, and sweet, and has a strange passion for Bill's shoes. He doesn't destroy them, just carts them around from room to room, lol. And... that sweet puppy brought about a revelation for Bill and I... we're ready for our own. The loss of my Sadie baby is still painfully fresh - I still look for her when I come home, sometimes still call for her when it's bedtime. The hurt is very present. But... having little Hunter around showed us that despite our misgivings, it was time. We talked at great length about what we wanted in a pet - age, breed, size. We decided that a gentle giant just isn't on the table - I can't bear it yet. We also knew we didn't want another pure bred. Having lost our Nakki, and then just a few years later (and very recently) our Sadie... pure breeds are a no-go. So... a mix. We wanted a puppy- a fresh new life we could bond with from day one. Nakki was almost 4 months old when we got her, and her personality was formed. Sadie was a rescue, and about 2 years old with a hard life behind her. So... puppy. We got on the internet, perused photos for hours, and stopped when the hubby said, "Wait, go back. That one. He looks like trouble." Lol. As we exchanged messages with the owner (her boxer had an unfortunate unsupervised visit with her Mom's husky), we began calling him "Imp". He just had that face. The next day, we drove an hour (technically it was NOT phoenix, lol) to meet with the owner, the Imp and his sister. And we fell in love. Doesn't he look mischievous??? We named him Loki. And he lost no time in living up to his name, waking me the next morning with a bite on the nose. Lol. He's adorable, and seriously... puppy breath. Hahaha. He and Hunter have become besties. They play together, nap together, play, nap. Lol. It's awesome! Despite my slight mishap, so far I'm impressed. The knives are lightweight, but the tang is full length, providing great balance. Anyway, so far, so (mostly) good. Lol. Next up... updates on the Official Recipe For Fitness Garden. It's still alive!!! The mushroom infestation seems to have died back to a dull roar. All but 7 of my gazillion asparagus have sprouted up (and the ferns are gorgeous!). They may still sprout, but (haha) I'm not holding my breath. The flowers are doing a wonderful job of bringing the bees in (to my delight and dismay), and several plants have blooms. My tomatoes have taken off, the romaine, edamame, and radishes in particular are doing great. And I haven't had to pull any dead plants yet. Yay!!!! Corn, Green beans, beets, brussel sprouts, carrots, peas, cucumbers, green onions, watermelon, spaghetti squash, and more flowers. Further updates on the personal front - one of the big things (which I can't yet discuss) is on hold - which places another big thing in potential jeopardy. I'm learning to just ride the wave on this. Either it will come home to shore or not. 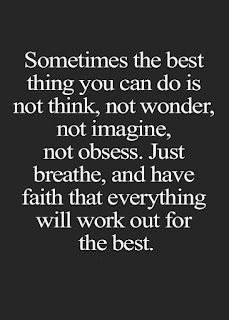 Worry won't change the outcome. The other, and bigger situation we've been dealing with for over a year (remember all that traveling back and forth to California last summer?) - well, we're moving forward in a new direction, and that is exciting, terrifying, and exciting and terrifying. Lol. Did I mention exciting and terrifying? ;-) Whether you pray or send good vibes, I ask that you do so our way. 2. 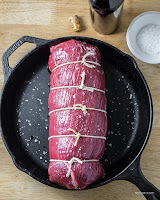 Lay flat the steak between two sheets of plastic wrap. Using a meat tenderizer, smash the bejeebers out of it until the steak is an even thickness. Discard plastic wrap. 3. Sprinkle both sides with sea salt & pepper. 4. In a large cast-iron (or other oven-safe) skillet, cook bacon over medium high heat until crispy, then lay strips on paper towels to absorb excess fat. Keep about 2 Tbsp of the fat in the skillet, pouring off the rest. Chop the bacon. 5. Add minced garlic to skillet and saute until fragrant (about a minute). Add broccoli and mushrooms and saute until mushrooms are softened (about 2-3 minutes). 6. In a medium bowl, mix bacon, blue cheese, and garlic/broccoli/mushrooms. 7. Spread mixture evenly over the flank steak, leaving about an inch of exposed meat around the edges. 8. Roll up the steak, starting with the short side. Use kitchen twine to secure (see note below). 9. Return skillet to the stovetop (medium high heat) and sear the steak roll on all sides (start seam side down). 10. Place skillet (uncovered) in the oven and cook for about 15-18 minutes (15 minutes gave us perfectly medium rare meat). 11. Remove from heat, placing steak on cutting board. Allow to rest for 10 minutes before slicing. 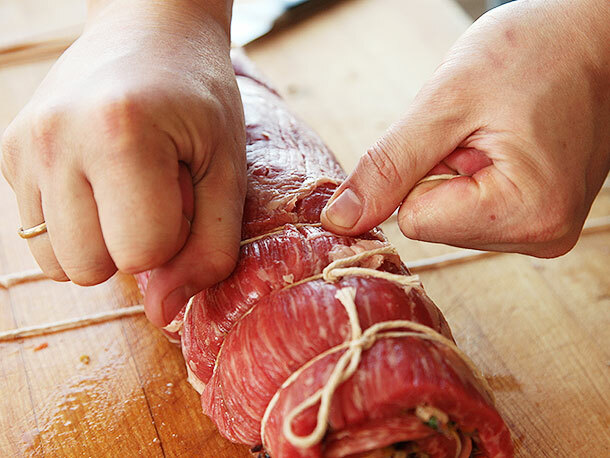 Note: Kitchen twine... truly the easiest method of keeping your stuffed flank steak together. Simply cut 4-6 pieces of twine each long enough to wrap around the steak - tie each off, and you're done. When you're ready to serve, simply slice around the twine, then snip it off once you've plated. Below is an example of a twined steak to show you what it looks like. Seriously, folks... this is a super easy recipe that looks amazing plated. Just tell folks you slaved for hours - they'll believe you! ;-) Serve with your choice of starch (mashed potatoes or sweet potatoes, lemon rice, rice pilaf, etc) and add a side of steamed asparagus. Prepare for serious yummage. It's only Wednesday, but I think we've crammed a couple weeks into the last 5 days. Last Thursday, bright and early at 5 (freaking) a.m., The hubby, one of our daughters, and I hit the road. You might recall that in November we lost hubby's grandma. Her husband passed a few weeks ago, and the double funeral they wanted was scheduled, so we made the drive to Sacramento. It was a beautiful service, with the most hauntingly gorgeous rendition of Taps I've ever heard performed. The family shared memories, laughter and tears. It was a good day to celebrate two incredibly influential lives. The next day, we were back on the road for the long trip home. (And for those of you wondering, Yes, I did pack my trusty cooler lol). We got home just after 10pm our time. The next morning I was anxious to see how my garden had done in my absence. Bethy had done a great job of caretaking, and nothing was dead that I hadn't already set on that path. Yep, the brown-thumb is still at work. I drug the hubby out to Home Depot on Sunday - under the guise of looking at pavers. Lol. He looked at pavers, I got about 10 more plants. Flowers for the front, a little watermelon for the garden, and a few packets of seeds. It's a sickness, I'm telling you. Oh, and I got 4 Citronella plants for the patio. Yay for no mosquitoes this summer! If the plants live, I mean. Monday was Leg Day. Enough said. (ouch). Tuesday was cooking class day - eggs. While I wasn't thrilled with the recipes, they turned out aesthetically nice, lol. So about that garden.... well, I'm still plucking mushrooms (cheeky little buggers). The tomatoes are developing nicely - I've got fruit on 3 out of 5 so far, with blooms on the others. The carrots have sprouted. The 2nd batch of beets have sprouted. The first batch doesn't seem to be getting any taller. Same with the turnips. Same with the buttercrunch lettuce, spinach, peas, and green beans. Hmmm. They all seem to have sprouted up quite nicely, then just stopped. My gardening buddy is getting tall enough to do some damage, so we're having to set some boundaries there... Hunter, get back here!!! BTW, the garden hose is a great teaching tool, lol. But seriously - that face. Lol. The romaine, cabbage and cauliflower are coming right along, and the edamame is doing GREAT!!! Corn is doing well (though I did lose a couple). Cucumbers are growing nicely. Eggplant... they're not getting any bigger. However... my lemon tree has several baby lemons, and the lime & grapefruit are putting out a ton of fresh foliage so they're doing great. The asparagus is ferning all over the place - yay!!! And yes, I really did put a fairy campsite under the asparagus. Hahaha! Woooohoooo!!! So it appears I can actually get some things to grow! Since I had room in the beds, I threw in some brussel sprout seeds, more onions, about 5 different kinds of peppers, and a few more broccoli seeds. 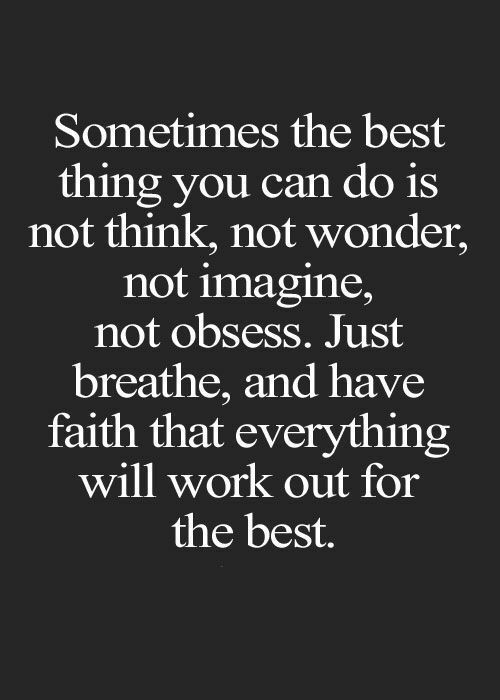 Hopefully something will take. Then, because really people - it's a sickness, I ordered more seeds. Don't tell my hubby, k? In all seriousness - with all that our family has been through over the last year, having something I can do that's practical as well as enjoyable is fantastic. I can't wait to actually harvest food for the table! Um, well, if anything actually makes it that long. I've also been incredibly grateful that I went with raised beds for the garden. Cuz, ya know, Leg Days happen. ;-) And, no weeds. Best part ever! Now, I have a tree I ordered just arrive, so I have to figure out which one it is (don't ask) and where I'm going to put it. Hmmmm. Sure hope it came with instructions!